SA Airlink is fast becoming one of South Africa’s leading air travel service providers offering passengers a flight experience with service beyond excellence and a choice ranging from 35 destinations across nine African countries. In operation for over 21 years, SA Airlink prides itself on total customer satisfaction. Their beneficial alliance with SAA affords travellers, besides the advantage of earning ‘Voyage Miles’, connections with ‘SAA’ flights as well as their ‘Star Alliance’ partners including other carriers in Southern Africa and globally. Fly Airlink in Southern Africa today, is the largest regional airline transporting passengers to smaller towns and local areas than any other domestic airline. Operating a fleet of ‘Jetstream 41’,’ ERJ 135 Jet’ and ’BAe RJ85’ aircraft, Fly Airlink carry in excess of one million passengers a year of which the majority are business travellers. Exciting news announced recently, for business and leisure travellers is the expansion of SA Airlink (and their alliance with ‘SAA’) as the first operator to provide passengers with direct flights between Cape Town and Pretoria. SA Airlink Wonderboom have entered into a combined commercial undertaking, offering air services to and from ‘Wonderboom Airport’ in Tshwane City that will commence in August and starting with three return flights per day. ‘Wonderboom Airport recently received a ‘face-lift’ enhancing it with facilities that meet the required standards for airline operators. Passengers flying with SA Airlink in and throughout Africa can for their convenience, make a note of the relevant contact information pertaining to their travel destination. We’ve scanned millions of one-way and round trip itineraries and found the cheapest flights on SA Airlink. You can see the best prices we are able to consistently offer to you as well as some of the most popular SA Airlink routes namely; SA Airlink flights to Johannesburg and flights to Wonderboom. When flying with SA Airlink, besides your checked baggage allowance and excluding any additional fee, each person may take hand baggage appropriate for storing in the closed overhead cubicle or underneath their seat. To take advantage of this benefit, the maximum dimension for each item allowed is 52x40x23cm and may weigh up to 8kg but should be no more than 115cm in overall dimension. Domestic and international flights allow 2 items for travellers in ‘Business Class’ while those travelling in ‘Economy Class’ are allowed 1 item with both classes allowing the addition of 1 slim-line laptop bag. Travellers (adults and children aged 2 years and above) flying with Fly Airlink receive a general free allowance of 20kgs in ‘Economy Class’ with 30kgs applicable for ‘Business Class’. Infants, under the age of 2 years, on all Fly Airlink flights are permitted 10kg plus one collapsible buggy. Exceptions exist for travellers (adults and children aged 2 years and above) flying between Johannesburg and Harare/Bulawayo/Lusaka/Ndola affording them an allowance of 30kgs in ‘Economy Class’ and 40kgs in ‘Business Class’. Travellers who are ‘SAA Voyager’ card holders benefit further with additional baggage allowances pertaining to their specific category. Travellers flying on an ‘interline no-stop ticket’ or ‘single contract’ and connecting with an ‘SAA’ domestic or international flight should check their baggage policy regarding MSC (Most Significant Carrier), Interline tickets, IATA Resolution 302 to ensure they do not exceed baggage limitations. To fully cover travellers’ needs and comfort by flying to smaller airports, SA Airlink utilise their medium-sized carriers where ‘hold-space’ might be restricted in particular weather or on full flights. In these occurrences Fly Airlink will do their utmost to hold all baggage, however for safety reasons, may need to transport some baggage on later flights. Passengers are permitted a maximum dimension of 90x72x45cm for any one piece of baggage (including handle, pockets and wheels) with a total dimension of up to 207cm and a maximum weight up to 32kgs. Bulky items are permitted with a maximum allowance of 190x75x65cm including handle, pockets and wheels but if you’ve exceeded your free baggage allowance, you may incur an excess baggage fee. Should your items however exceed these dimensions, you can still book them in as cargo by contacting the relevant cargo number above. For further information on cargo you can go to: www.airlinkcargo.co.za. SA Airlink are big on customer service and satisfaction and if you are flying with them for the first time, take a moment to read further comprehensive information on their website at: www.flyairlink.com. Familiarise yourself with all they have to offer with answers to any questions you may have. 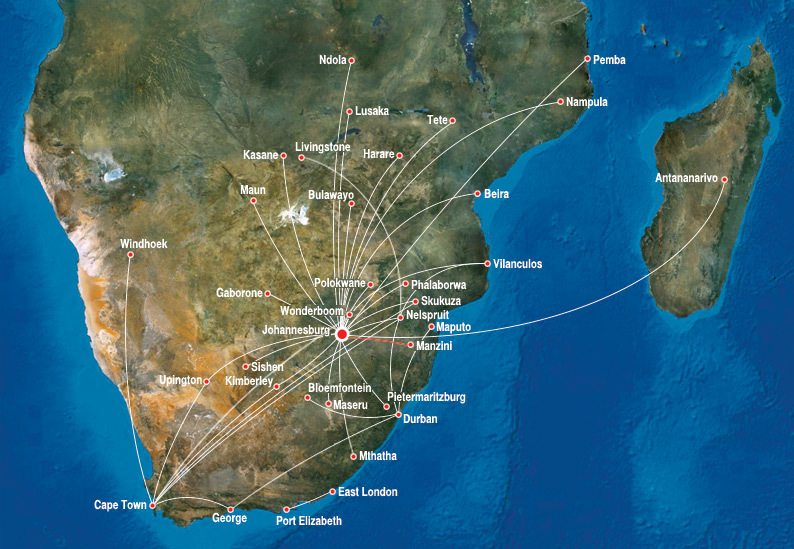 SA Airlink flies to 35 destinations located in nine African countries.